NEWPORT BEACH — Numerous catches — including a marlin release — highlighted Stan Miller Yachts’ 10th annual Cabo/Hatteras/Viking Challenge Aug. 17-19, a sportfishing event for owners of Cabo, Hatteras and Viking yachts. Tournament fishing began following registration and a kickoff party at Basin Marine in Newport Beach, and fishing continued all day Aug. 18 and 19. “The tournament is always a weekend filled with fun, food and fishing, and the 10th annual Challenge was no exception,” said Nikki Selter of Stan Miller Yachts. This year’s tournament also offered some of the best fishing in recent memory. This year was also the first that John and Brad Buettner and the crew of Stan Miller Yachts welcomed owners of Viking yachts to the Challenge, in addition to Cabo and Hatteras owners. Conditions were ideal for fishing at this year’s event, with warm-water exotics moving into local waters. Boat owners and their guests had their sights set and their eyes open for marlin, dorado, bluefin tuna and yellowtail. On Friday night, owners and guests prepared their boats, loaded them up with food and fuel, and headed over to Basin Marine Shipyard, where the festivities kicked off with a cocktail party and captain’s meeting hosted by Stan Miller Yachts. While many stayed listening to live music and socializing until the end, others headed out into the dark, down to the tuna grounds. Greeted with calm seas, summer temperatures and warm water, the fishing was hot. Boats were spread out far and wide, down into Mexico waters and up north to the Channel Islands. Reports came in early of a marlin hook-up and release on Paul Arentsen’s Cabo 35 Blue Chip, captained by Tracy Merrill, within the first hour of fishing. Throughout the weekend, boat captains within radio range were chattering with reports of yellowtail and dorado on kelp paddies, and various marlin hook-ups — and even a shot on a marlin for owner Dewayne Brown on the Cabo 40 Oh Joy, up north near the Channel Islands. Most of the boats in the group decided to spend the night at anchor Saturday in Pyramid Cove, to unwind and enjoy a nice relaxing dinner and a good night’s sleep, in preparation for tournament fishing on Sunday. Throughout the weekend, Tournament Control, officiated by Caprice Baxendell of Stan Miller Yachts, provided tournament updates and raffle prizes, thanks to many participating sponsors. The festivities continued Sunday evening, when a dinner and cocktail party wrapped up the event — and awards and trophies were presented. Trophies were awarded in the categories of Tuna, Yellowtail, Dorado and Marlin. Tranquility, a Cabo 35 owned by Steve Strauss, took honors for Top Boat in the tournament, with great scores on yellowtail and dorado. 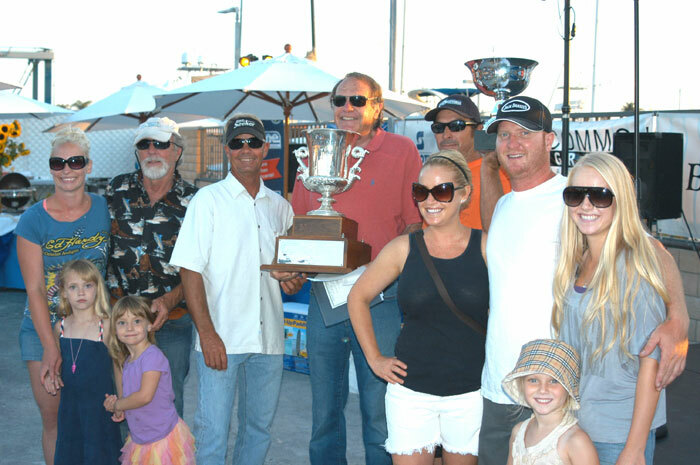 “The 10th annual Stan Miller Yachts Cabo/Hatteras/Viking Challenge was a great success and provided owners, families and guests some incredible Southern California sportfishing,” Selter said. A new addition for next year’s 11th annual Stan Miller Yachts Cabo/Hatteras/Viking Challenge, scheduled for Aug. 16-18, 2013, will be a check-in at San Diego, to alleviate the Friday afternoon drive for San Diego participants in the tournament. For those who missed out on this year’s tournament and wish to participate in next year’s challenge, or to become an event sponsor, contact Selter at Stan Miller Yachts, (619) 224-1510 or nikki@stanmiller.com; or Baxendell at caprice@stanmiller.com.